Any chef will love this sign, perfect for the kitchen and a great complement to the chef of the house. Classic retro font made from high grade stainless steel in a brushed satin finish. Our 100cm signs come attached with 15mm pegs, giving the signs a 3D/shadow look. Rawl plugs and screws are also included. 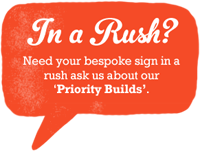 50cm signs come with self-adhesive fixings. All our signs are made in England.